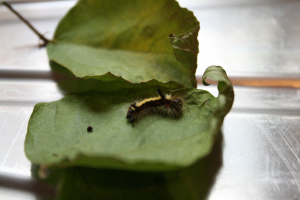 Observation - Caterpiller - UK and Ireland. Description: Furry black with little red stripes along the side and one large,yellow stripe on top from head to bottom. One black furry antena! Furry black with little red stripes along the side and one large,yellow stripe on top from head to bottom. One black furry antena!